It's been a while since I wrote a post on Lt. Col. Robin William George Stephens, a.k.a. Tin-Eye Stephens, fearsome former commandant of MI5s secret wartime interrogation centre, Camp 020. I have, through this blog and my website, made contact with a distant relative of Stephens. Together, I'm hoping that we might crack the case of Stephen's death and place of burial. In the meantime, I contacted the author of the 2014 Medal News article who has Stephens' India General Service Medal. I thought that perhaps tracing the history of the medal might lead us closer to Stephens himself. The author of the Medal News article bought the medal in the 1990s from a dealer in Norfolk. Information that accompanied the medal indicated that "it was formerly in the collection of a well-known collector, Colonel Kingsley Foster and sold by Glendining (formerly a leading London dealer) in December 1971. Quite likely Foster acquired the medal directly from Stephens." That seemed like a rather tantalizing lead. A quick internet search led me to a website entitled "The Nugents of Antigua". 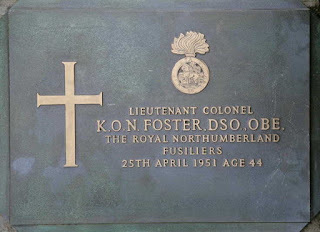 An entire page is devoted to Kingsley Osbern Nugent Foster, a member of the Peerage who served with the Northumberland Fusiliers. The website gives quite a bit of history for Kingsley and I won't repeat it here, other than to say that the information came from Kingsley's daughter, Patricia Foster. I did learn a few things. 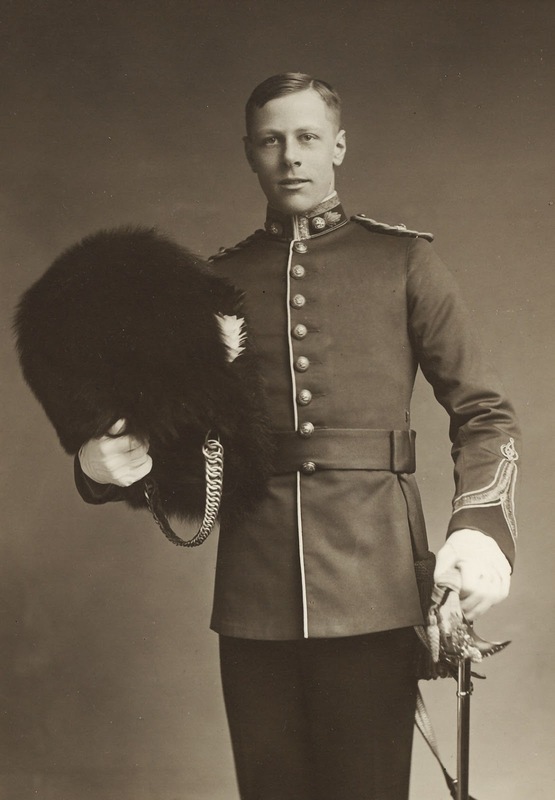 Kingsley was a serious medal collector and amassed a collection that was "second to few in the British Isles and was the greatest authority on the subject in the army. He had already published one book on the subject and was writing a second". From what I can gather, Kingsley's first book was entitled "The Military General Service Medal Roll - 1793-1814", published in 1947. 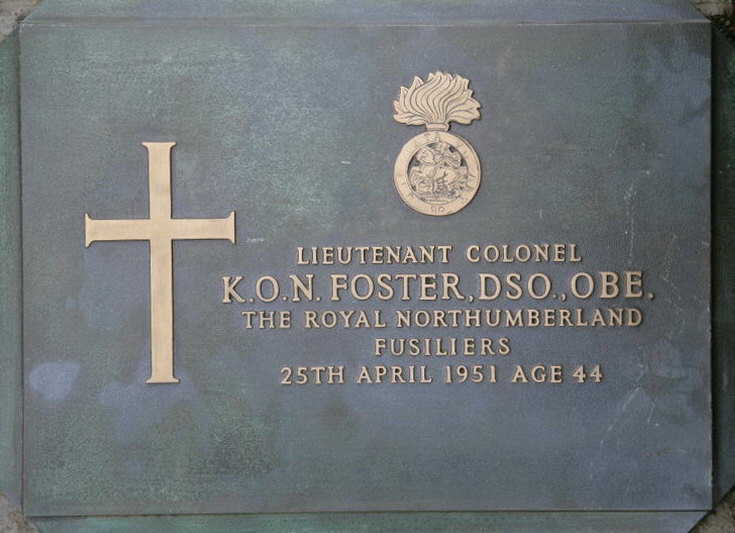 Alas, before Kingsley could publish his second book, he was killed in action while commanding the 1st Battalion, Royal Northumberland Fusiliers at Imjin River, Korea on 25 April, 1951. He was only 44 years old. He is buried at the United Nations Memorial Cemetery in Busan, Korea. What became of Kingsley's amazing medal collection? Some of them ended up at the Regimental Museum, Alnwick Castle. Others were sold to support his widow. But what about the General India Service Medal of our friend, Robin William George Stephens? 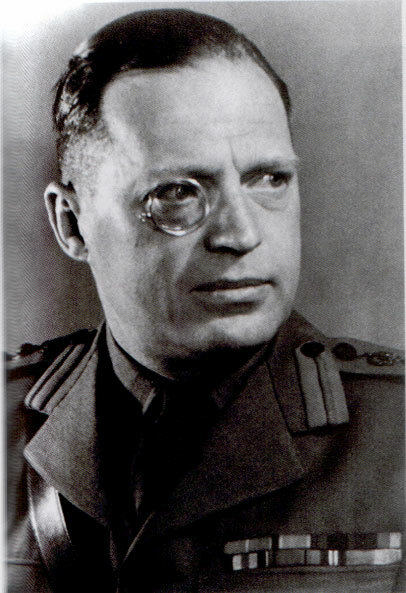 Given that Kingsley passed away in 1951, it is highly unlikely that he purchased Stephens medal after that date. Stephens must have sold the medal to Kingsley, or to some other medal dealer, at some point prior to that, perhaps in the mid 1930s, when Stephens declared bankruptcy. Hard to say. I had been using the 1971 date as a loose bookend, thinking that Stephens must have passed away before that date if his medals were being sold off. Clearly this is not the case. So, the last real trace we have of Stephens is 1963, living in Brighton. Beyond that, we do know that he was deceased when his wife Joan passed away in 1992. A rather broad expanse of time, but we will just have to keep digging. A lot of the provenance aligns with the information on your website. However, bits missing include periods as the first encumbent in a new MI5 role in Accra ((the in the Gold Coast) as Security Liaison Officer from 1948 after his period of association with Nenndorf, followed by a posting in c May 1951 as Head of MI5's Secret Intelligence Middle East in Cairo (taking over from Bill Magan, whose written handover briefing to Stephens dated 28.4.51 is publicly available). This latter posting may have lasted until c1953/4 when a reduction in SIME staff (it would be disbanded by 1958) led to the top job being merged with that of the Deputy Head and the Head of the Counter-Intelligence Section (this timing would fit with your information re the move to the Port and Travel Control Group). Thanks for the link! I heard that there was some question about the provenance of the medal - that it might be a replacement, not the original. Do you have a link for the Bill Magan briefing document - National Archives? Still trying to piece together Stephens' post-Bad Nenndorf career - just tidbits here and there. The Magan document should be available under reference KV4/238. I have a pdf of a substantial research document about SIME that I can email to you if you can share your address. Have now read in Twilight of the British Empire that Stephens was with SIME from 1951 to 1953. The latter date seems to tie in with the SIME 1953 reorganisation I mentioned previously. The Magan report references you wanted are also itemised in the book. Thanks again - will track down a copy of this reference and have a look.